I recently moved to Prague and I am looking for a partner to climb regularly with. I started climbing again after an almost 3 years break. 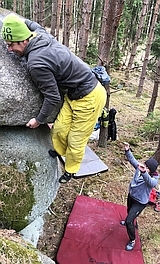 I have experience in sport climbing (6b+ outdoors) and multipitching. I am also interested in trad climbing (I have only a small experience).